Roasting tomatoes concentrates their sweetness. See all the tricks here – fast roast, slow roast, halved and whole. Preheat oven to 220°C (425°F). Line a shallow ovenproof tin (I use a Swiss roll tin/jellyroll pan) with baking (parchment) paper. 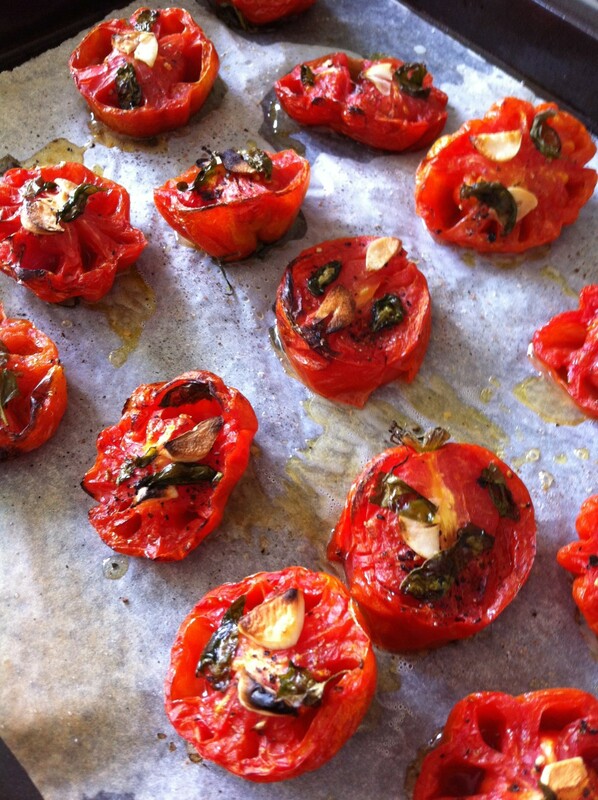 Put whole tomatoes, leaving calyxes intact if liked, in lined ovenproof tin. Rub with olive oil and dust with caster (superfine granulated) sugar. 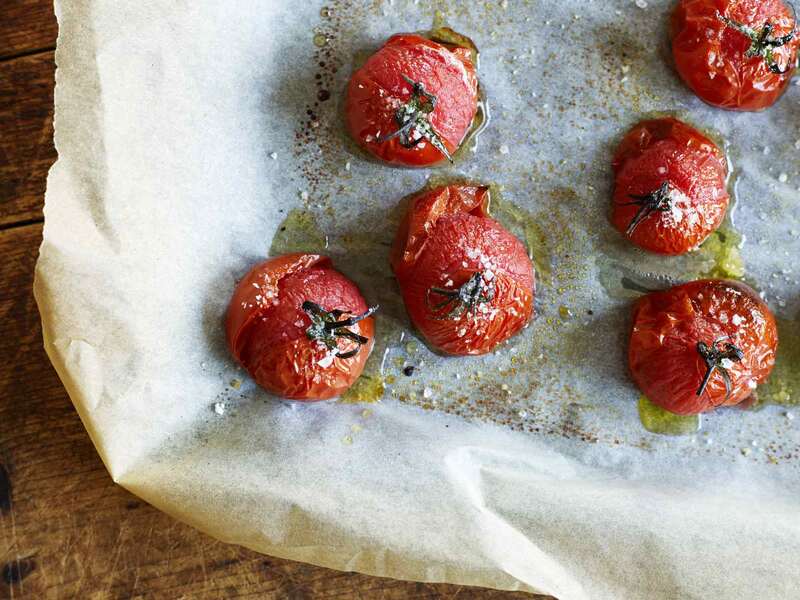 Bake for about 15 minutes, until tomatoes colour a little and start to collapse. Cut tomatoes in half and arrange in tin. Sprinkle with sea salt and caster sugar. Grind over a little black pepper. Drizzle with extra virgin or lemon-infused olive oil. If liked add a sprig of thyme or small basil leaf and a sliver or two of garlic. Roast for 20-30 minutes until collapsing and charring around the edges. Preheat oven to 140°C (275°F). Line a shallow ovenproof tin (I use a Swiss roll tin/jelly roll pan) with baking (parchment) paper. Prepare tomatoes as described above in Fast roasting halved tomatoes. 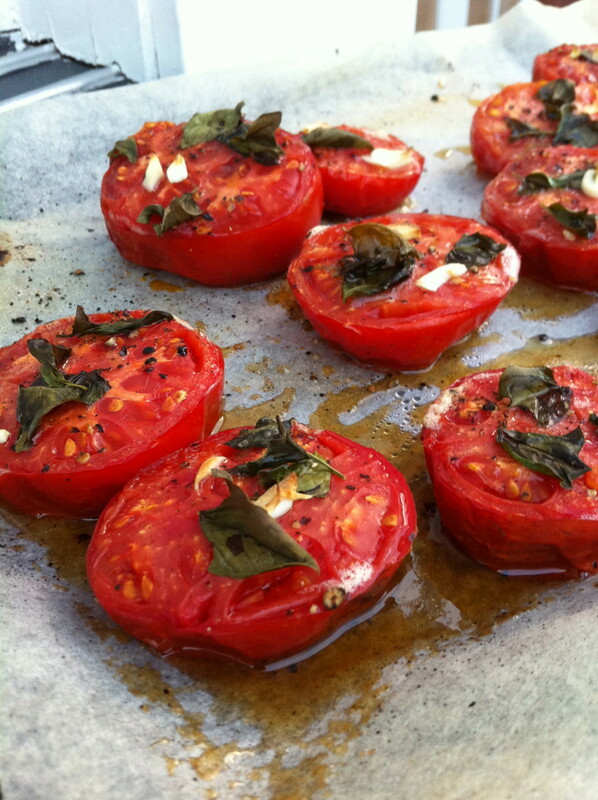 Bake for about 1 hour, or until tomatoes have collapsed and are lightly browned, and juices are turning syrupy.